My car was repossessed while I was in boot camp. Was that legal? 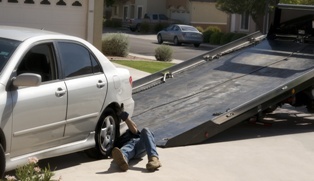 Not only is it rotten of a lender to repossess your car while you are away, it may in fact be illegal. It all depends on how they went about it. Under the Servicemembers Civil Relief Act (SCRA), if you are in training or have been deployed, a lender must get a court order to repossess your car, no matter what the reason for defaulting on payments is. If they don’t get a court order and they take your car anyway, they may owe you damages. As with any loan, if a servicemember took out a car loan and made at least the first payment before entering military service, the lender must get the court to review and approve any attempt at repossession of the vehicle. The court has the authority to require the lender to delay the repossession or to order the lender to refund prior payments. The court may also issue any other order it deems necessary to protect members of the military while they are serving our country. It is incumbent upon the lender to determine whether their borrower is an active duty member of the military before taking any action, so they really have no excuses. There are dozens of cases of illegal repossession of servicemembers’ vehicles every year in California alone. Even if time has passed since your car was repossessed, you may still be able to take action against the lender who took your car. If they are found to have violated your rights under the SCRA, you may be awarded damages. Recent cases in California have resulted in wronged servicemembers being awarded $10,000 in addition to lost equity in the vehicle with interest, and having their credit repaired. As a military man myself, I have a special interest in protecting the rights of our men and women in uniform. You are already making a great sacrifice for our country and should not be burdened with the added worry of having your car taken away—or worse, having it taken away from your spouse who is caring for your family in your absence. If you are being threatened with repossession, call me and we may be able to nip the problem in the bud. If your car has already been repossessed, we may have a claim for damages. The best part is, you won’t owe me a dime unless we have a valid lawsuit and you are awarded damages. I know this is confusing, but I am happy to answer any questions you have. Call me or fill out the contact form on this page today!